Spam can open up a whole can of, well…opportunities! The Wrigley Mansion in Phoenix found that out when their Spam Cubano Sandwich became an award-winner and one of the most popular items on their lunch menu! 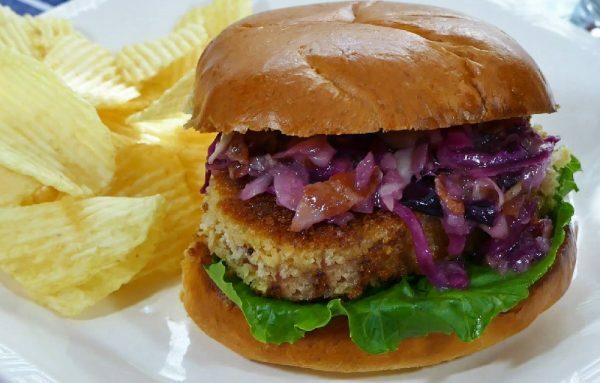 So when I stumbled upon this recipe for a Spam Burger topped with a tasty sweet and sour slaw, I was ready to put the “Spam, Glorious Spam!” slogan to the test. I’ve also discovered along the way that there are, for the most part, two groups of people. Those who love Spam and those who’ve never tried it. (Maybe there’s a third group–people who like it but won’t admit it?) Well, this recipe is for all three! It’s taking Spam slices that you’ll dredge in flour, dip in egg and roll in panko and then lightly fry in a skillet. I think the real star of the show, however, is the warm slaw. It’s got a great blend of sweet, spicy and salty, and it’s really the perfect complement to the grilled Spam. Ok, let’s get serious with this recipe. Grill up some hamburger buns, brioche or pretzel bread, give it a good slather of sweet and spicy mustard and then top the Spam with the warm slaw. I’m just going to say….be prepared to be super surprised by this Spamtactular Sandwich!